Last night saw the inaugural ‘We are One’ awards for Gloucestershire. Brought to Gloucestershire by Remembering Srebrenica and the County Hate Crime Strategic Group. Often those who take a stand against injustice or intolerance get overlooked because their acts are seen as too ‘small’ because they focus on individuals, local areas or community groups. But these upstanders make huge differences in the lives of others. We see the outcomes of these ‘small’ actions through our work, in the story of Šefko and Jovo in Balvinje in the Bosnia war 1 ; the images of Renee Rachel Black and Saddiq Patel comforting each other at the Manchester terror attack commemoration or the many stories which are noted at the Gloucestershire Strategic Hate Crime Forum. It is our intention with these We Are One Awards to recognise these ‘small’ actions for their real, huge impacts. nominations in our first year. Young Upstander – Sulaiman Hasan – arrived 3 years ago from war torn Syria. 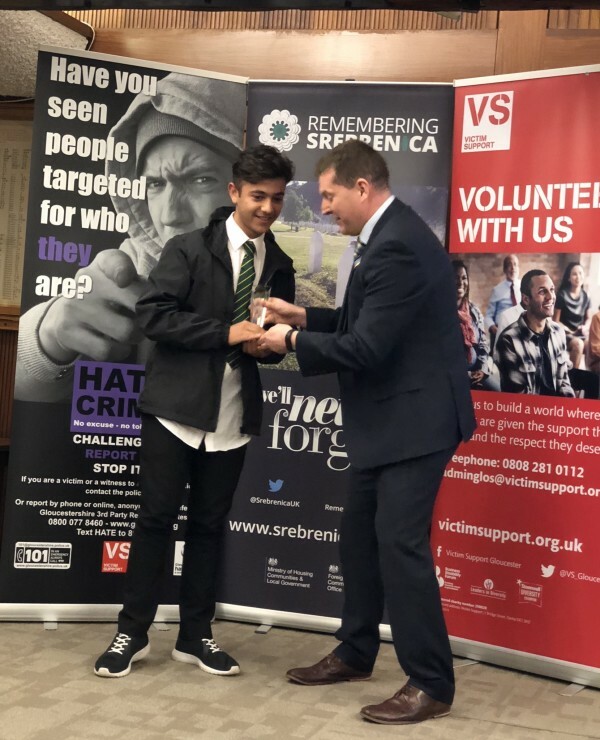 Sulaiman was nominated by his school St Peters High, and described as a young person who stands up for what is right without fear of reprisal. He spoke up about an incident saying he “..was not going to be quiet because what had taken place was wrong”. He is described as thoroughly decent, with an ability to rise above all the negativity that life has thrown at him and deserving of recognition. situations like refuges and those receiving sexual violence services. Community Upstander – Kamel Boulkenafet – Kamel supports care leavers in supported housing. 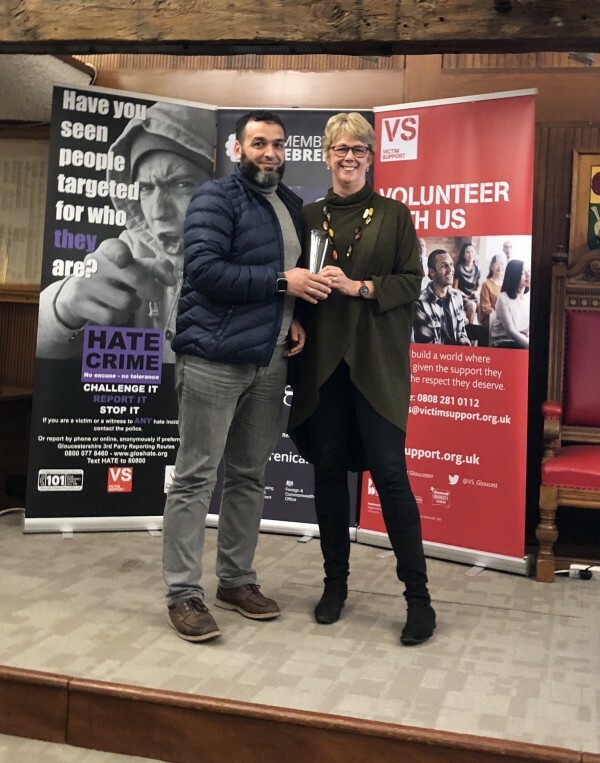 He supported a 15 year old refugee from Guinea who had fled violence in his own country and had only been in Gloucester for a few weeks when he was viciously assaulted in Gloucester Park. Kamel immediately came to this young man’s assistance, contacting the police, taking him to hospital and being there for him. He advocated for him with the police and referred him to Victim Support. He acted as translator and guardian, giving the young person a voice in extremely trying circumstances. He went above and beyond to stand up to prejudice and intolerance. 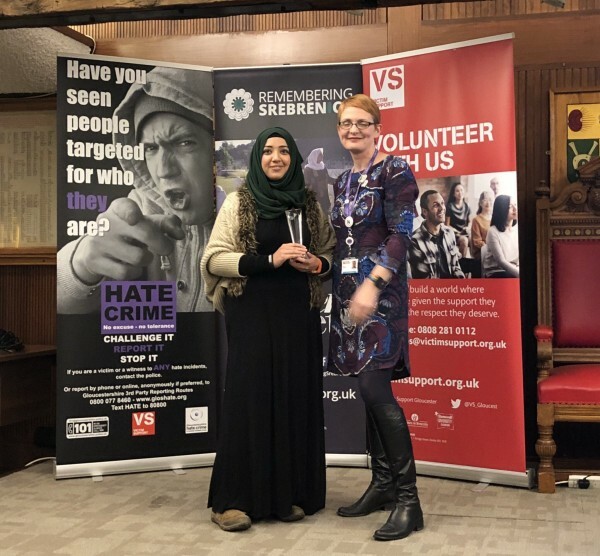 Public Services Upstander – Sayima Al-Haddad – Sayima was nominated for the support she has offered outside her day job to the charity Crimestoppers. She has given her time, multilanguage skills and personal experience of being a muslim woman in a multi-cultural environment. 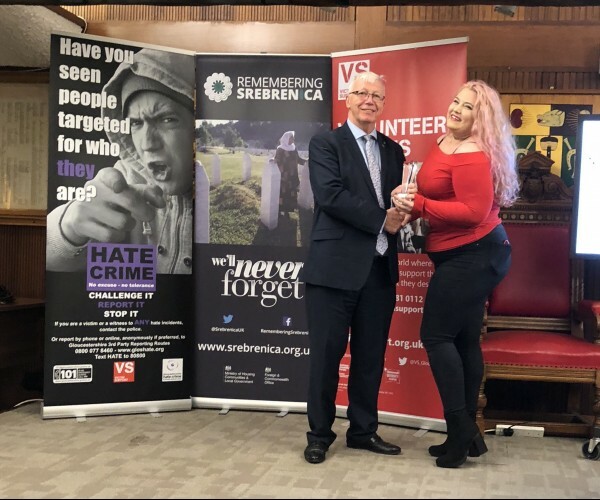 She recently walked the streets to chat with local businesses and agencies to gain an understanding of the barriers to people speaking up and to highlight Crimestoppers as a route to giving anonymous information about crime. She is described as having dedication that is second to none. 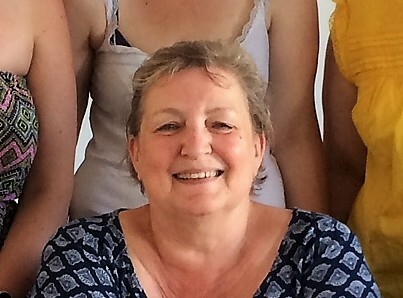 She has said that she has a clear vision to bridge the gap where under-represented communities are not being heard, recognising that everyone has a voice and a vital part to play. Cheltenham Together and is strongly committed to bringing communities together.